Part Used & Method for Pharmaceutical Preparations: The fungus is gathered in spring, autumn and winter. It is cleaned, dried in the sun and, finally, pounded into powder. It is also made into pill form. 1. Hookworm and roundworm. 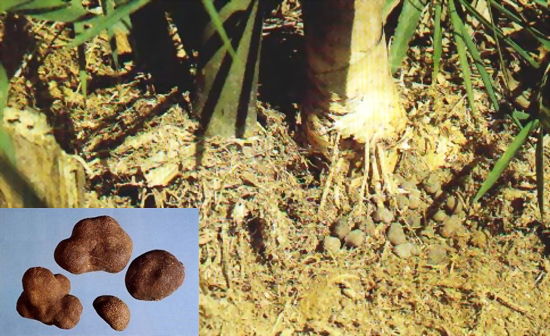 Omphalia (Leiwan) is used with Areca seed (Binglang) and Chinaberry bark (Kulianpi). 2. To treat cestodiasis, 60 grams of the herb powder alone can be orally taken for two consecutive days. To treat ascariasis and ancylostomiasis, the herb can be used in combination with areca seed, quisqualis fruit and other anthelmintics. Dosage: 6-15 g, Used in pill or powder. Precautions: The active ingredients contained in the herb are destroyed when heated or mixed with acid. Therefore, the herb should not be decocted and mixed with acid. Toxic or Side Effects: Slightly toixic. Omphalia contains omphalin-a protease, which is an effective ingredient for expelling teniae. Omphalin plays its tenia-expelling role by decomposing the proteins of the parasites so much that their nodes are destroyed. It can also kill ascarids, ancylostomi, Trichomonas vaginalis and bladder worms.